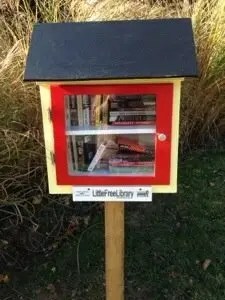 Does your community have a Little Free Library yet? These have been sprouting up around my county lately and I am really impressed with the concept. Take a book, add a book. It feels like finding lost treasure. The first LFL I saw was focused on children’s books, which was excellent because I was at the park with my sons, who were more than happy to sit on a bench and tuck into a new tale. The box I found today had Arundhati Roy, Ann Patchett, Jeffrey Eugenides and, well, a biography of Tony Hawk. I didn’t expect every book to be for me. But I was pleased to see so many that did appeal. Nice work, neighborhood. Nice work, Little Free Library. Follow @LtlFreeLibrary on Twitter for updates.